Thanks to everyone who voted. I love asking you guys on Insta-stories what you think of all the things I try. It's like getting a second opinion from a trusted friend. Anyway I returned this cashmere sweatshirt because not only was it an unflattering fit (as most sweatshirts are) but the collar was super tight and even though this is made of cashmere, it gave me a slight itchiness around the neck (I just looked and it's because the trimmings are 9% nylon and 1% elastane along with cashmere). I did find that if I rolled the bottom hem under, it did make the sweatshirt look a tad more flattering. But for $150, your money is better spent on their regular cashmere sweater or for $5 more get the waffled one. As for sizing, I got this in my usual Everlane size of small. So anyways, unless you're really going to spend big bucks lounging in cashmere, I would advise to pass on this sweatshirt. 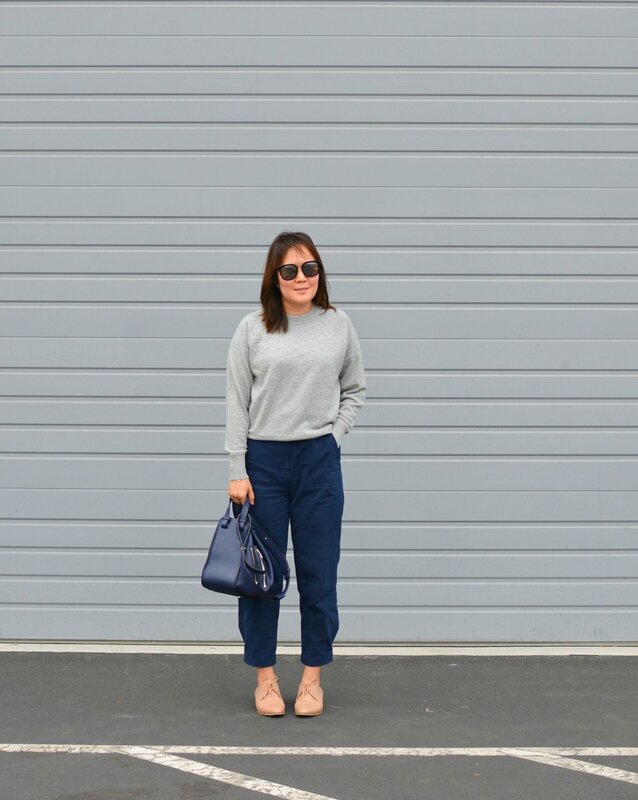 Also I've tried cashmere sweatpants before (from Grana) and found that it's just too hot to wear that indoors and pretty impractical to wear outdoors (especially if it's rainy or windy). Have any of you guys tried cashmere loungewear and what did you think? Oh and happy Thanksgiving (to my fellow Americans). I am so grateful for all you guys who support me with your comments, questions, and purchases through the blog! Thank you thank you thank you!